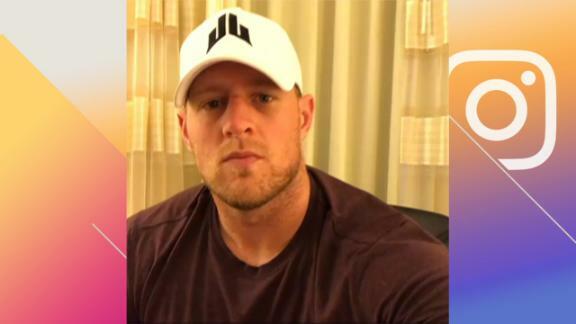 Texans star J.J. Watt released his final fundraising figures for those affected when Hurricane Harvey hit Texas, announcing on his website that his Houston Flood Relief Fund's combined fundraising efforts brought in more than $37 million. Watt's relief fund disclosed that it raised a total of $37,132,057 and had 209,431 total donors to the foundation, an effort the Texans All-Pro defensive end started by posting appeals on social media. "There are not enough words to thank you all for your generosity," Watt said in a statement on Friday. "If there is one thing that I have taken away from these last few weeks, it is the reassurance of how much good is out there in our world. When times are the toughest, humanity stands at its strongest and you have all helped to prove that emphatically." Watt announced the fundraising page with a video on Twitter after Houston's preseason game against the Saints in Aug. 26, with a goal of collecting $200,000. As donations kept pouring in, he raised the goal again and again. The number skyrocketed thanks to almost 200,000 donors, a group that included Jimmy Fallon, Ellen DeGeneres, Drake, Tennessee Titans owner Amy Adams Strunk and Houston Rockets guard Chris Paul. Watt also worked with his foundation to fill 12 semitrucks with supplies, which were taken to Houston and distributed in part by Watt and his teammates in the aftermath of the hurricane. "There are many places you could have donated your hard-earned money and I'm honored you have chosen to join this effort to support the people who were affected most by Hurricane Harvey," Watt said in his statement. "Please keep this spirit of helping one another alive. The world is a better place when we all take care of each other." Watt was named the NFLPA's Community MVP last week for his work in the days since the hurricane and flooding devastated Houston and much of southeast Texas. He becomes a semifinalist for the NFLPA's Byron "Whizzer" White Award, given annually by the group to recognize charitable efforts of players.